Believe it or not, magical things happen to Bacon strips when they are marinated in Coke for an extended period of time. 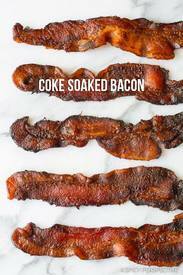 Coke Soaked Bacon is so tender and uniquely flavored. Because Bacon strips are so fatty, they don’t absorb the Coke, per se. So the bacon doesn’t become ultra sweet as one might think. Instead, the carbonation and sugar break down the Bacon making it limber and easy to bite through, once cooked. The Coke also seems to reduce the salt a bit leaving the Bacon with a dusky caramelized flavor. All you need is 2 ingredients and 25 minutes to prepare this delicious recipe from A Spicy Perspective. Its so easy, you’ll make excuses to serve it on everything!